I love that line, because in a sense, it’s been the mantra of my life for the last four years. I’ve definitely been on the road for the last four years. Perhaps the person who knows this the most, other than me, is my mother. She frequently reminds me how much I’ve been on the road. Too much, perhaps. Yet, not enough, perhaps also. The desire to pack up my suitcase and go wherever I can as often as I can bit me four years ago on this day. At the time, I was a national officer for my sorority, Sigma Kappa. I wasn’t writing for Forbes yet, and in fact, I hadn’t even started RulingSports.com. So, at that moment of my life, my travel for the sorority was the only travel I did outside of trips with friends. On Martin Luther King Day weekend in 2011, I flew to Iowa to visit one of my best friends and her family. On the way back to California, I had a layover in Memphis. My connecting flight was delayed, so as it turned out, my layover ended up being around five hours long. When my flight from Iowa touched down in Memphis, I rushed straight to the rental car counter. I paid $100 to rent a car for a few hours. I had somewhere to go, though. Somewhere I was willing to pay any price to see. Especially on this day. As a child, my hero was Martin Luther King, Jr. Every year on his birthday, I would wake up and read his “I Have A Dream” speech, and cry that we as a society still hadn’t gotten it all right. I’d smile, though, at the hope that the dream persists. After leaving the rental car counter, I made my way to the Avis shuttle. The driver, an older African-American male, shot the breeze with me, a young, light-skinned Caucasian. We talked about music and food and life. We laughed and both muttered “mmmhmm” to the more serious things that arose in our conversation. Our conversation seemed to have lasted days, because we covered so many topics. Our conversation seemed to have lasted days, because it flowed so naturally. When he dropped me off to pick up my car, I said, “Thank you, sir!” And he said, “Now, don’t forget the directions I told you! They’ll take you right there!” “Of course I won’t forget. Thank you, again,” I said. And from there, I drove. And I felt freedom unlike anything I had ever experienced in my life. I was alone, on the road, doing what I wanted to do and seeing what I wanted to see. I followed his directions. A few turns here and few turns there. And then finally, I turned the corner and there it was. A page from a history book ripped out and laid right before me and my rental car. I scrunched my face up the way I do when I don’t want my emotions to pour out. And then I cried. 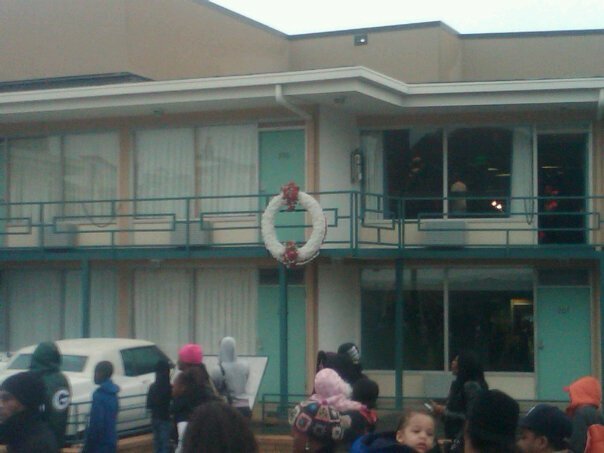 In front of my car was the balcony where the man who was my hero was shot to death. In front of me was the spot, where for a brief period in history, hatred overcame love. In front of me was a place where the dream could’ve died. 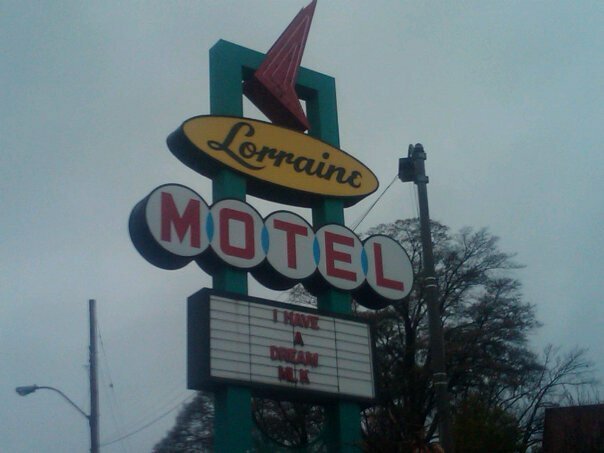 I’ll never forget that winter day in January 2011 when I parked my car and under a grey sky, walked alone towards the Lorraine Motel. For once in my life, I was grateful for solitude. As someone who is usually surrounded by many, I was glad it was just me and my thoughts together on that day. In the last four years, I’ve traveled alone more than I can count. And even though sometimes the road is a lonely place, it also provides a release for me. For me, there’s something cathartic about being behind the wheel, unsure of where I’m really going, with just me, my thoughts and the road. The road is also fun. I’ve met some characters in the last four years. That Avis rental car shuttle driver being the first of many. There have been chefs, professional athletes, maids, businessmen, doormen, and even the occasional rock-and-roll band that have come into my life while I’m on the road. These people have all made it a little less lonely. Overall, though, the road will always be a second home to me, because of the opportunity it gives me to step outside of my comfort zone. Don’t get me wrong: I love home. And some day, I hope to have a husband and babies to keep me home more often. Yet, there’s something that being on the road does to drive you out of your comfort zone and into finding yourself. As a 30-year-old, these days when I listen to Dr. King’s “I Have A Dream” speech, I think what he is really trying to say, is that in order to experience life to its fullest, in order to love to the greatest boundaries of our hearts, we must step out of our comfort zones. We must do that which we may fear. We must do that which maybe doesn’t feel natural. And we must risk that which has never done before in order to live out our greatest potential and love to the best of our abilities. Because, if we do all of these things, we’ll see the “golden lands” in Kerouac’s words, or the “Promised Land,” Dr. King preached about. And then, life will finally feel complete.